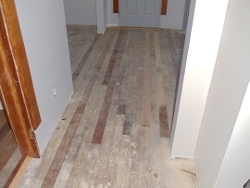 The first photo shows a floor after several repairs had been made, which included replacing damaged and missing boards. 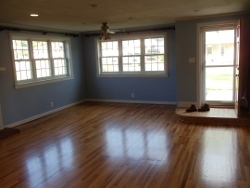 The second photo shows the same floor after its potential was realized by Carver’s Hardwood Flooring, LLC. In the first picture you will notice the obvious hole, a return air vent no longer used, in a main traffic area that needed to be repaired. There are a number of splintered boards that needed to be replaced as well. 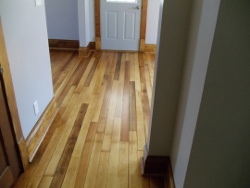 The second picture shows the repairs completed; reclaimed Southern Yellow Pine flooring was used. The third picture shows the final product after sanding and the application of two coats of polyurethane sealer & two coats of polyurethane finish. 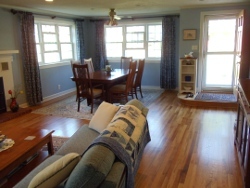 This particular Red Oak floor was installed in the 1950’s. It was covered with carpeting sometime later. 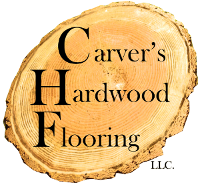 You can see the beauty of the floor was revealed when Carver’s Hardwood Flooring, LLC was contracted. 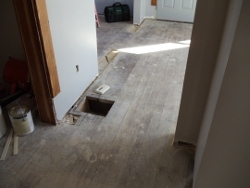 The first step was to remove the furniture; then remove the carpet, and pull all staples and nails. Fourteen separate boards, that had been damaged long ago, were cut out and replaced. 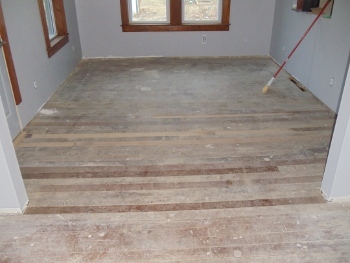 The floor was then sanded with five separate grits of paper, and nail holes were filled. Two coats of sealer were applied. 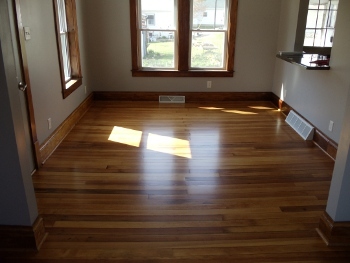 The floor was then screened to smooth the grains, and then thoroughly cleaned. Two coats of Polyurethane Satin finish were applied. 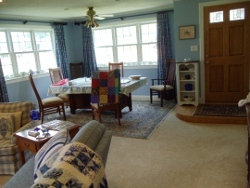 Lastly, felt was installed on all furniture bottoms, and the furniture was placed back into the room to the homeowners liking.